The Greenwell Glory Trout Fly is one of the most famous of all British trout flies, this pattern was first tied as a wet-fly in the mid-nineteenth century. Developed for fishing on the River Tweed, it is named after a certain Canon Greenwell and even after one hundred and fifty years it still makes a very good imitation of all the olive upwings. Today, the Greenwell’s Glory is tied in a variety of forms, from the original winged wet-fly to a spider, a nymph and, as here, a splitwinged dry-fly. Although some modern commercial versions use olive floss for the body, the original used yellow silk, well-waxed to produce an olive hue. Equally important is the fact that this waxing also makes the thread translucent — an effect that cannot be replicated by the opaque floss. 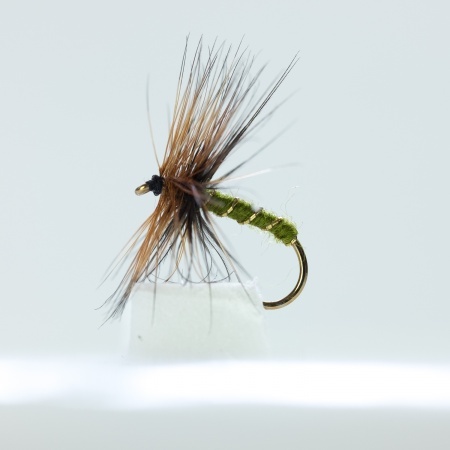 This dry-fly version of the Greenwell’s may be tied with or without a tail and, interestingly, unlike Canon Greenwell’s first pattern, it has a gold-wire rib.